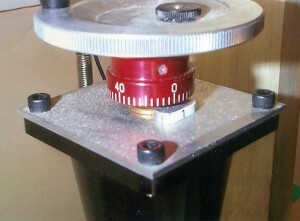 A handwheel in place of a stepper motor on CNC-ready tools by Stan Figora - Millhill Supplies Ltd.
Stan’s solution to a way to operate a Sherline CNC axis manually when a stepper motor is not available or needed. When ordering Sherline tools “CNC-ready” it should be noted that they cannot be operated manually until stepper motors with a through shaft are mounted. Some customers know they will eventually want to use their tools using CNC but would like to learn to use the tools manually first. At present, the only alternatives are to either purchase manual tools and convert them to CNC later or to purchase CNC-ready tools and add stepper motors to each axis just so you can attach handwheels to the rear shafts. Stan got around that limitation by machining a simple aluminum plate that attaches to the stepper motor mount. He fitted a brass bushing in the center hole and made a short 1/4″ diameter shaft to go between the shaft coupling inside the housing and the handwheel. Because the bushing raised the handwheel collar above the surface of the plate, he attached a small piece of aluminum in which he scribed the zero reference witness mark.